The couple in turn sold 400 acres (1.6 km2) in 1871 to (Samuel) Frederick deBary, a wealthy wine merchant from New York City, and that same year he erected a hunting lodge. Called "DeBary Hall," the 8,000 square foot (700 m²), 20 room Italianate mansion featured a two-tiered veranda, stables, an ice-house and the state's first swimming pool, fed by a spring. Visitors included President Ulysses S. Grant and President Grover Cleveland. Over time he acquired an additional 9,000 acres (36 km2), planting orange groves and pecan trees. There is some debate as to whether this was actually the first pool in Florida, as a St. Augustine pool has also made the same claim. One possibility is that this was the first Spring-fed pool in the state (See Orlando Sentinel article). 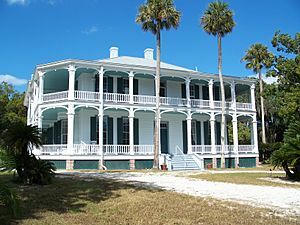 Frederick deBary died in 1898, and his mansion is today a restored museum, listed on the National Register of Historic Places in 1972. The estate, reduced to 10 acres (40,000 m2), now features the community's oldest building, the Arnett House. Incorporated in 1993, the City of DeBary is named for its noted settler. DeBary is located at . According to the United States Census Bureau, the city has a total area of 21.4 square miles (55 km2), of which 18.2 square miles (47 km2) is land and 3.2 square miles (8.3 km2) (15.02%) is water. 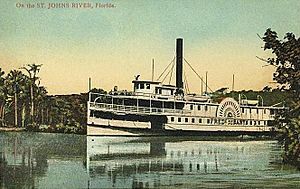 DeBary is situated on the St. Johns River near Lake Monroe. As of the 2010 United States Census, there were 19,320 people residing in the city. The racial makeup of the city was 83.7% White, 3.7% Black, 0.2% Native American, 1.9% Asian, 0.0% Pacific Islander, 0.2% from some other race and 1.2% from two or more races. 9.1% were Hispanic or Latino of any race. As of the census of 2000, there were 15,559 people, 6,538 households, and 4,720 families residing in the city. The population density was 853.8 inhabitants per square mile (329.7/km²). There were 7,001 housing units at an average density of 384.2 per square mile (148.4/km²). The racial makeup of the city was 94.94% White, 1.90% African American, 0.20% Native American, 1.13% Asian, 0.01% Pacific Islander, 0.86% from other races, and 0.96% from two or more races. Hispanic or Latino of any race were 4.15% of the population. There were 6,538 households out of which 24.8% had children under the age of 18 living with them, 61.1% were married couples living together, 8.5% had a female householder with no husband present, and 27.8% were non-families. 22.7% of all households were made up of individuals and 12.4% had someone living alone who was 65 years of age or older. The average household size was 2.37 and the average family size was 2.76. In the city, the population was spread out with 20.0% under the age of 18, 4.9% from 18 to 24, 24.9% from 25 to 44, 27.2% from 45 to 64, and 23.0% who were 65 years of age or older. The median age was 45 years. For every 100 females there were 92.1 males. For every 100 females age 18 and over, there were 88.3 males. The median income for a household in the city was $43,364, and the median income for a family was $50,022. Males had a median income of $36,813 versus $25,920 for females. The per capita income for the city was $23,283. About 5.2% of families and 6.9% of the population were below the poverty line, including 8.6% of those under age 18 and 6.4% of those age 65 or over. DeBary is served by VOTRAN's #23,#31, #32, and #33 routes. DeBary is served by SunRail, the Central Florida commuter rail system. 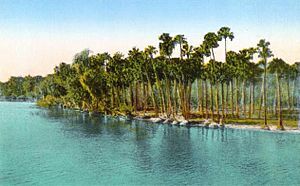 DeBary, Florida Facts for Kids. Kiddle Encyclopedia.